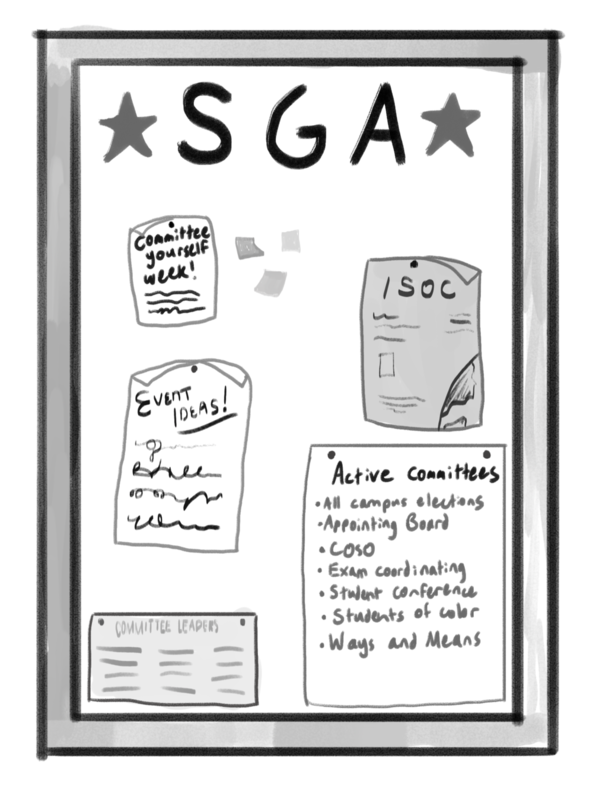 Student Government Association (SGA) Committees are student-run focus groups that work to solve problems to plan and to regulate systems that enable the smooth functioning of various aspects of the Mount Holyoke community. They range in function from planning community projects and events to overseeing funding, helping ease orientation for international students and even managing the various student organizations on campus. While committees are student-run, many work with staff and administration in order to achieve their respective goals. In honor of Committee Yourself Week, the Mount Holyoke News wanted to take the time to feature a few of the many committees that are now accepting new student members. The International Student Organizing Committee (ISOC) is run by co-chairs Anisha Pai ’19 and Di Guo ’21 and is one of three Identity Committees on campus. ISOC’s mission is to create a safe and inclusive space for international students as well as to provide resources and support to facilitate an easy transition for students studying abroad in the United States. Some of ISOC’s current programs include international students’ Orientation, putting out a journal publication and hosting various events such as snack tastings and open-mic nights. ISOC also hosts the annual Global Fest, a celebration of the diversity of culture in the community, featuring booths from each of the cultural organizations on campus, food, performances and music. “[Global Fest] is really about getting to revel in your own culture,” said Pai. In addition to these programs, ISOC plans to host a series of “more dialogue-focused” events in the future, with topics ranging from understanding and addressing queerness in international cultures, African and Asian cultural diasporas and overcoming the cultural barriers that international students often face when studying at a foreign school. Although ISOC’s primary focus is on the international community, domestic students are also welcomed and encouraged to attend their events. “Domestic students that come [to ISOC events] say that they enjoy it, and that they actually learn something about being an international student here,” said Guo. Apart from ISOC, another important SGA committee is the Committee on Student Organizations (COSO), headed by Zoe Brown ’21 and Lydia Henning ’21. COSO is responsible for the organization of and communication between all of the student orgs that exist on campus. This committee is also responsible for reviewing ideas for new committees, approving them and looking after the budgeting requirements of all Mount Holyoke’s orgs. A major event that COSO is responsible for is the Involvement Fair, which takes place once every semester. The Involvement Fair is meant to connect the student body, particularly new students, to orgs on campus, offering students a chance to discover the more than one hundred clubs that Mount Holyoke has to offer. Apart from ISOC and COSO, another notable committee is the ever-important Ways and Means Committee. Ways and Means is the financial overseer for all recognized student orgs, dividing and allocating money collected from the student activity fee included in Mount Holyoke’s tuition. They also ensure that the funding and transferences of money to SGA-approved orgs is being used in accordance with the school’s guidelines and are the financial voice for these student orgs. The Ways and Means Committee updates their guidelines every year, following audits at the end of each semester and a budget presentation to the SGA in April. According to Mar’i, the Committee also works closely with both the Business Office and the SGA treasurer to maintain financial records for each org. Prospective Ways and Means members should expect to work hard and be flexible. “[Every member needs a] willingness to actively engage with students to ensure the MHC community has fair access to event,” said Mar’i.